31st August 1997. Rose Wilson is 14, but looks 16. Pimped out by her ‘boyfriend’, she has seen more of the darkness in life than someone twice her age. On the night of Princess Diana's death, Rose snaps and commits two terrible crimes. But a defence lawyer takes pity and sets out to do what he can to save her. Present day. DI Alex Morrow is a witness in the case of Michael Brown – a vicious, nasty arms dealer. During the trial, while he is held in custody, Brown's fingerprints are found at the scene of a murder in the Red Road flats. It's a mystery that Morrow just can't let go. I listened to this while DIYing, so will have to listen again because I'm sure I zone in and out sometimes, but overall I thoroughly enjoyed this book. The writing is a bit formulaic; for example, each time a new character (no matter how small) is introduced, there follows a physical description. The narrator seemed to put a negative emphasis on the word 'fat' which made me wonder if it was the writing or the narration that made it seem a bit simplistic at times; relying heavily on stereotyping and preconceived ideas (but maybe that's just what the police do???). So I would say its a bit more 'Da Vinci Code' than 'Wolf Hall' in style. All that said, I liked the characters and sympathised with them, becoming engrossed in the plot. I will defo read more from this author. Excellent outing for DI Morrow. Great story, well told. Like the Glasgow references, fish suppers and cafe culture with a difference. Looking forward to the next one. Too many twists and turns! What did you like best about The Red Road? What did you like least? I like Denise Mina's novels a lot but found this one over complicated and too self-consciously "arty". The first hour introduces so many story lines and time shifts that I almost gave up. It is a book that would probably work better as a text than an audiobook.... I kept wanting to look back to see who was who. Has The Red Road put you off other books in this genre? No. 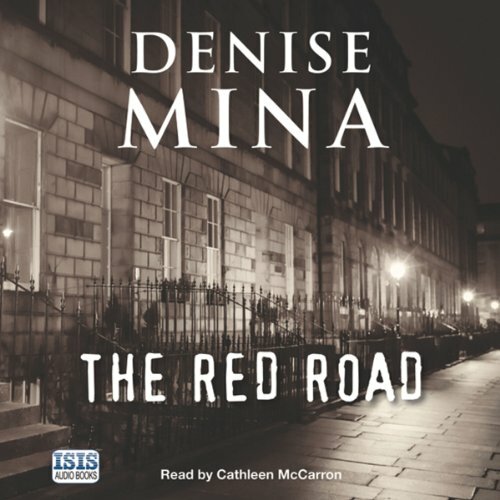 I've liked most of Denise Mina's books and this is a genre I generally enjoy. Which character – as performed by Cathleen McCarron – was your favourite? McCarron is a good narrator and does her best with the text. The character of Rose is particularly interesting and I was disappointed that her capitulation at the end didn't fit in with the character which had been portrayed until then. Could you see The Red Road being made into a movie or a TV series? Who would the stars be? It could make a good short tv series though they would need to lose some of the vast cast of characters.